130-132 High Street, Old Woking, Surrey GU22 9JN. This William and Mary house, said to have been built in 1715, is described in The Heritage of Woking published by Woking Borough Council, as a Locally Listed Building of Architectural or Historic Significance. Pevsner says big early C18 house now split in two…….. Dated 1715. In 1719 the copyhold site was occupied by a brewer William Harvest. Prior to this in his will made 3rd March 1678 Robert Tacka, brewer devised his brewhouse to his sister, Mary Merest the wife of John Merest, vicar of Woking. It is likely that this brewhouse was on the same site as the Old Brew House. At this time the Old Manor House opposite was probably the parsonage of Woking. In February 1979 the house was owned by the Surrey Community Development Trust and there were nine young people living there. However, because part of the building was deemed to be unsafe Woking Council arranged that the residents be moved to alternative accommodation. 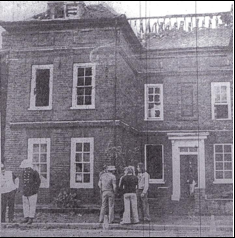 The house was, therefore, unoccupied when fire broke out on Friday, 8th June that year quickly gutting the first and second floors and destroying most of the roof. As a result it was thought prudent that the remaining structure be taken down to first floor level. Following a public inquiry the work of reinstating the building began under the paternal eye of the Environment Secretary with a view to renovating and rebuilding the house more or less in the same condition as before the fire occurred. Future occupancy was planned to be a mix of office and residential accommodation. Although the carved staircase had been demolished by the fire together with the old wood panelling,the staircase was rebuilt in a similar style to the original and skirtings, architraves and cornices copied from surviving sections. New hand-made brick were obtained to blend in with the old ones and brick arches and sliding sash windows included as a concession to the original design. The work of reinstatement was completed in 1983 and the house as it stands today is a good representation of the old building although due allowance must be made for the reinstatement carried out between 1979 and 1983 and any changes made between the original construction date and the fire. The house has been sympathetically and faithfully restored more or less in the same condition as before the fire occurred. The house is a three unit house with the two end units projecting both forward and backwards creating small courtyards at front and back. The brickwork over the front entrance door is of particularly high quality containing both red and what looks like yellow London brick and includes an inscription H/WM* and the date 1715. The initials probably refer to William Harvest qv pg 1 and Mary Wheeler who married at St Peter’s 4th March 1689.The window frames are set flush with the wall and the sash windows on the ground and first floors are of the same height. There is fine quality brickwork and pointing in the window heads and excellent string courses around the building. There is nothing in the present house to dispute the 1715 date given for its original construction. The ‘H’ of the plan on the right is the house with the downward sections joined in the middle with the court yards at the front and back. The adjoining portion to the left, 130 High Street is a later addition not part of the Old Brew House and originally known as Magnolias presumably after the mature magnolia tree in the rear garden which happily survived the fire. 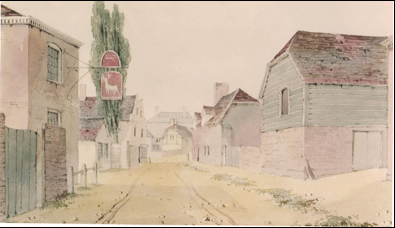 There are two early water colours which feature the house namely the water colour of 1780 below which originally formed part of King George III’s Topographical Collection now in the British Library and a later Edward Hassell water colour of Old Woking High Street dated 1830. 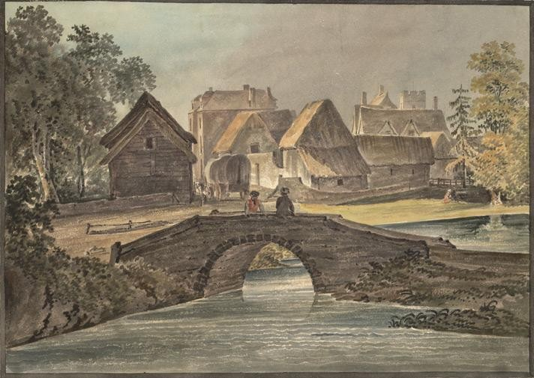 The British Library website comments Daniel Defoe wrote of Woking in the early 18th century: “Woking, a private country market-town, so out of all road, or thorough-fare, as we call it, that ’tis very little heard of in England.” At the time of this water colour, the town consisted of low-built timber dwellings. The embattled top of the church tower can just be seen, as well as a more modern three-storey building in the background. What is now High Street ran from the left of the picture past the horse and wagon towards the Send turning. The bridge in the foreground was probably on the site of the modern bridge leading to what was Woking mill. The three storey building is present day Old Brew House and some of the buildings between it and the River Wey probably the brewery. On this side of Old Brew House was Moorhatch a house which stood until the end of the 19th century when being then in a dilapidated state was demolished and replaced by a line of Victorian cottages. Edward Ryde’s diary notes in 1889, Mr Gavin Jones to build on Moorhatch. On the left of the church in Church Street stands the house now known as Weylea. In this view of the Brew House there are three storeys of windows and if the picture is accurate the third storey must have been removed some time between then and today. Today both at the front and the back there are brick aprons above the first floor windows which might represent a previous third floor or led the artist to suppose there were three floors. In the Edward Hassell water colour below the Old Brew House appears in the misty background its presence being emphasised by its dominating height. The fact that the house was deemed to be unsafe in 1979 may have been due in part to a problem with damp. There is evidence of attempts to insert a damp course on the front left hand side of the house and elsewhere and there are also what probably are intended to serve as ventilation holes bored from the outside to the inside of the building. The brickwork at ground level on the front left hand side has been rendered. There is evidence that similar rendering has been attempted elsewhere. Perhaps removal of this rendering might enable the bricks to breathe a little more freely. The windows on the first floor are a little unusual on the inside in that the window space appears longer than the actual window leaving a filled in space below the actual window. Would this have anything to do with a floor above having been removed? It is likely that William Harvest the brewer baptised 1667 and buried 1741 established his brewery on this site. Certainly he occupied the copyhold site in 1719 according to the John Remnant map. The Court Rolls have an entry made on 15th October 1762 noting the surrender by a William Harvest of the Brew House late in occupation of George Harvest to John Fenn. The Woking Land Tax returns show Richard Fenn as the owner of the house between 1791 and 1796 during which time he was also the occupier of the Parsonage (Old Manor House) opposite. The occupants according to the census returns in 1841 and 1851 were Thomas Newman, brewer and Samuel Strong, brewer and maltster employing seven men respectively. The Tithe map of 1841 confirms that Thomas Newman and others were the occupiers and Keziah Stevens the owner. The Court Rolls in 1852 noted the death of George Robinson the younger who held copyholds in trust for his father George Robinson the elder, by then also dead. These included a messuage or tenement together with the brewhouse, malthouse…….. (probably the Old Brew House) …. formerly in the occupation of Simon Parsons, afterwards of John Fenn the elder, since of James Fenn then of Messrs Gilbert and Emmens and then of Thomas Newman. The copyholds also included the White Horse now in the occupation of Thomas Stillwell, the messuage or tenement formerly called or known by the name of Mongers but now known by or bearing the sign of the Crown and Anchor and in the occupation of Mary Sharp plus another piece of land with the Railway Hotel (now the Sovereigns) lately erected by Thomas Newton. According to the census returns in 1861 there was just Mary Lunn, a house servant and a visitor and in 1871 Harry William Charrington, practical brewer, maltster, wine and spirit merchant employing six men. Strong (1851) and Charrington are important names in brewing history. Edward Ryde acquired the old Brewery in 1884. His diary records in October that having gone over the premises he was determined to buy them. Earlier he had commented, The place is much dilapidated and neglected but there is much old building and the house will convert into two tenements. A entry in 1885 notes, Give Southen (sic) possession of the Brewery House (East). This was his gardener who was living at the Old Manor House in 1891. He later purchased Moorhatch, the next door property. Prior to purchase he commented, Find the whole place in a most lamentable state of dilapidation. The house was subsequently demolished (1887) and Edward Ryde spent much time renovating the river bank and planting in the Brewery and Moorhatch meadows. Edward Ryde’s estate was sold by auction on 2nd November 1892 following his death. The Old Brewery was one of the lots. 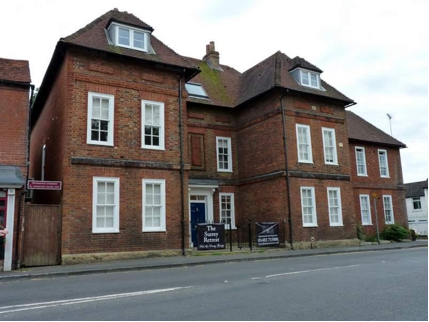 The Brewery House (now 130-132 High Street) was described as being of brick and tile, used as two cottages and occupied by the gardener Charles Southin and late bailiff’s wife Catherine Gristock. The Brewery Offices, to the south of the Brewery House, built of brick and tile had been converted into a cottage occupied by the cowman. The old brewery premises were also still standing. Charles Southin and Catherine Gristock referred to above were living at the Old Manor House at the time of the 1891 census.